AP Photo/Jeff RobersonCivil rights leader Rev. 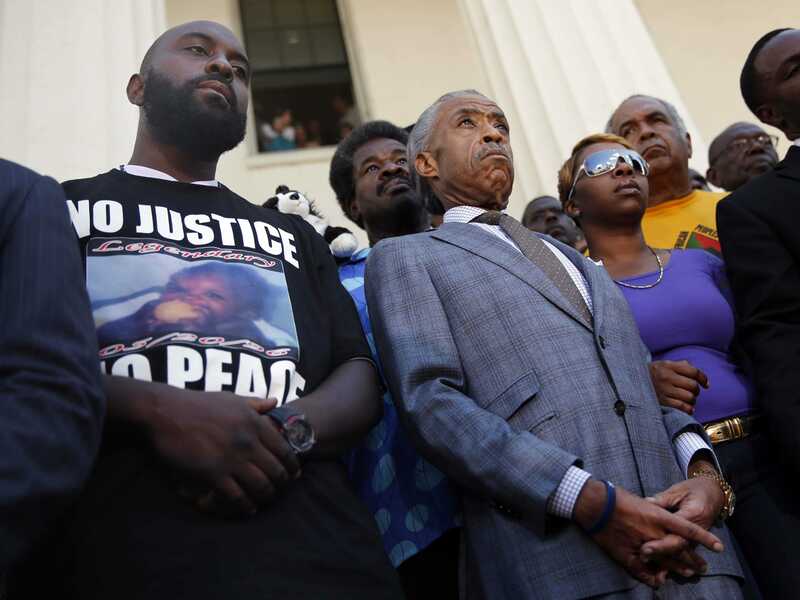 Al Sharpton, center, stands with the parents of Michael Brown, Lesley McSpadden, right, and Michael Brown Sr., left, during a news conference outside the Old Courthouse Tuesday, Aug. 12, 2014, in St. Louis. Brown Jr., 18, who was unarmed, was shot to death Saturday by a Ferguson police officer while walking with a friend down the center of the street. Michael Brown’s family isn’t backing down after a grand jury declined to indict the officer who killed their unarmed, teenage son in August. In a fiery press conference the day after the grand jury’s decision was announced, Brown family attorney Benjamin Crump castigated the entire grand jury process. “We object as publicly and loudly as we can on behalf of Michael Brown Jr.’s family that this process is broken. The process should be indicted,” Crump said Tuesday afternoon. In particular, Crump slammed the St. Louis County attorney’s office for allegedly being too cozy with the police and for peddling soft-ball questions to Darren Wilson, the officer who shot Brown. The attorney’s office released thousands of pages of documents detailing the grand jury proceedings, which Crump said proved the flawed nature of the local legal process. Crump was speaking the day after violent protests roiled Ferguson, a relatively small suburb of St. Louis. Businesses and police cars burned as authorities cracked down with tear gas in an attempt to regain control of the streets. Rev. Al Sharpton, an ally of the Brown family who spoke at the same press conference as Crump, further questioned the prosecutor for releasing the grand jury decision at 8 p.m. instead of earlier in the day. “A strange decision in a town that has been tense, in a town that has been forecast to have all kinds of problems, his solution is: Let’s announce it at night after dark. Let’s make sure that all the kids are home, that all the students are back for Thanksgiving break, and it’s dark outside,” Sharpton said. Sharpton then reiterated his call for the federal government to get involved in the Brown case.